Foley & Co. of Chicago made a range of medicinal products starting in the 1870s, the most well known of which was Foley’s Honey and Tar Compound. 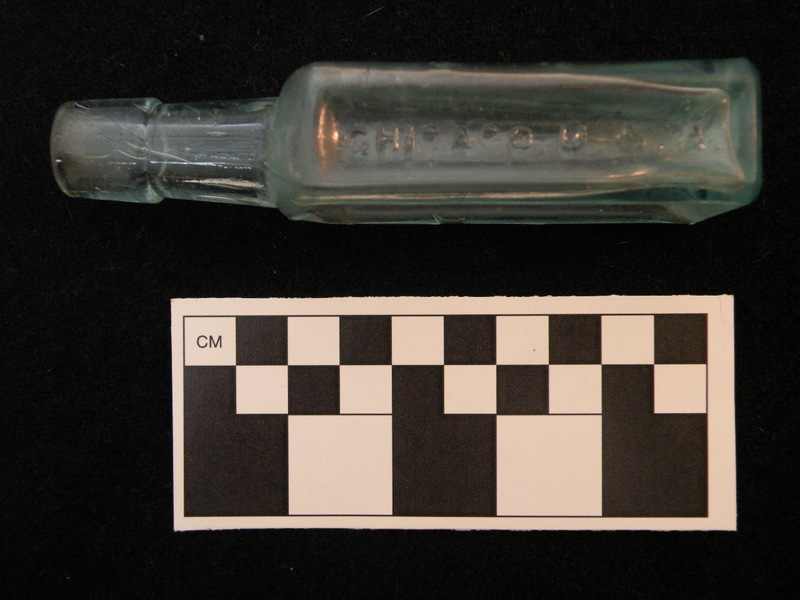 This bottle was from a less well known but still successful pain relief product. 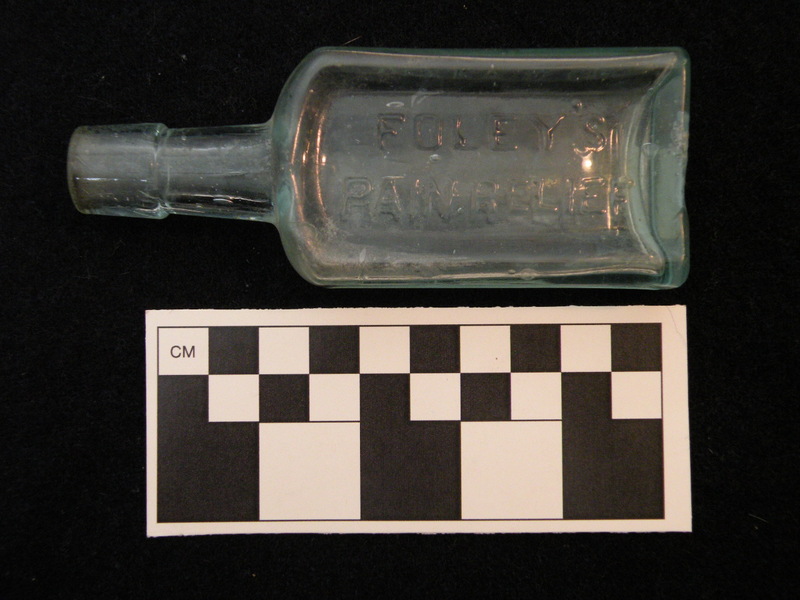 “The use of Foley’s cough syrup was long-lived — it was retailed during the late 1800s until the mid-1960s. In the early days, Foley’s concoction was 7 percent alcohol mixed with a special solution of pine tar and honey, terpin hydrate, sodium benzyl succinate and gum arabic. The recommended dosage for adults was one teaspoon; for children, a half teaspoon; for infants, five to 10 drops, according to the directions on the label of another undated bottle. Foley’s mixture cleared the throat of phlegm and mucus, stopped the tickling, opened the air passages for easier breathing and coated inflamed surfaces with a soothing medicine, according to an advertisement published in The Evening Independent of St. Petersburg, Fla., in 1919. There isn’t much written history about the founder of Foley & Co or the inventor of Foley’s Honey and Tar but records do show that two men, John B. Foley and Harry B. Foley, were associated with the business. From N.A.R.D. Notes, Volume 9, Issue 12 (Google eBook) National Association of Retail Druggists, 1909. The Book of Chicagoans: A Biographical Dictionary of Leading Living Men of the City of Chicago, from 1911, is more definitive, naming John Burton Foley as the founder of Foley & Co.
John B. Foley’s aforementioned real estate interests in Alabama must have been substantial because they named a town after him. Around the turn of the century, there was a great deal of negative press surrounding patent medicines, which brought about passage of the Pure Food and Drug Act of 1906. In an attempt to dispel some of that negative association, Harry B. Foley wrote an article for Western Druggist, a trade magazine widely read by pharmacists and drug store merchants. Foley tries persuade retail druggists that patent medicines are a great deal for them commercially, as well as protecting them from any unhappy customers. Supposed testimonials from Foley customers. Excerpt from True Republican Newspaper, January 7, 1905. 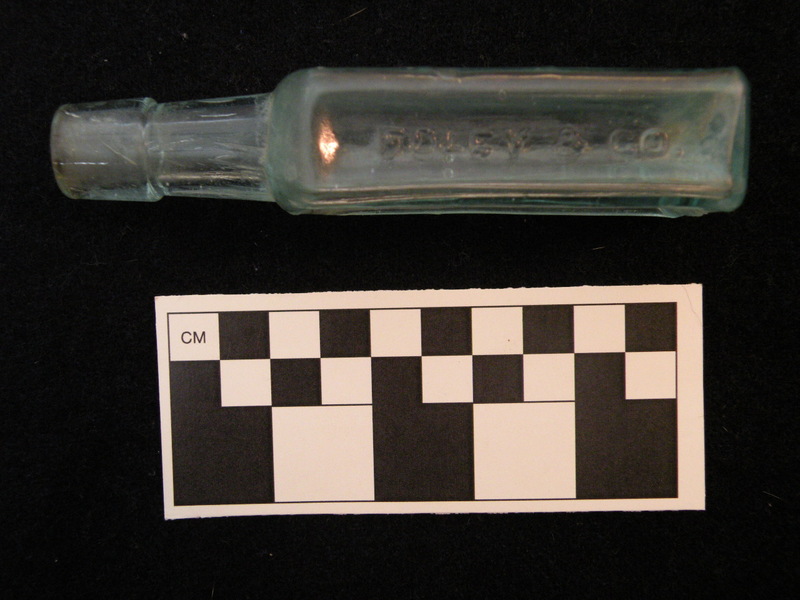 An example of similar packaging and labeling that would have originally accompanied the bottle recovered from the Old Main site. Foley’s Family Almanac with calendars for 1913 & 1914. Ad for Foley’s Family Worm Candy, “Is Your Child Troubled with Worms?” from the Foley’s Family Almanac, 1925. Ad for Foley’s Honey and Tar Compound, Stroudsburg Daily Times,1889. Ad for Foley’s Kidney Cure, date unknown. Ad for Foley’s Honey and Tar. From the State Herald (Mexia, Tex. ), Vol. 6, No. 51, Ed. 1 December 21, 1905. I have an unopened bottle of “Foley’s Kidney Remedy” This bottle is sealed and has both front and back labels. It shows a price of One Dollar or Six Bottles for $5.00. At the bottom of the front label it states: No, 502 GUARANTEED BY FOLEY & CO.,UNDER THE FOOD AND DRUG ACT, June 20, 1906. The Directions for Use are in English and I believe German. My Question is: Do you believe this has any value to your company? I have a Foley & Co bottle that’s no taller than my pinkie finger. Found it in Burlington MA in the early 1970s at a construction project..